A Government proposal to address the medical crisis engulfing critically ill refugees detained offshore has been firmly rejected as window dressing on the existing unconscionable process which has seen 12 people die in offshore detention in the past five years. 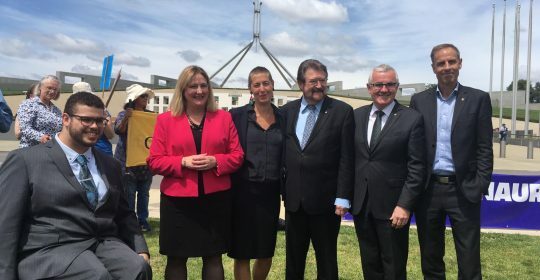 A coalition of refugee and humanitarian organisations has confirmed its support for a crossbench, Greens and ALP-supported Urgent Medical Treatment Bill, which will go before the Lower House when Parliament resumes on February 12. The Bill passed the Senate last year, despite the filibustering of the Government. The Morrison proposal released today does not make the necessary changes required to ensure people in offshore detention are provided with adequate medical care. And only limited details have been provided. The proposal mirrors previous ineffectual mechanisms set up by Scott Morrison promising to address critical issues in offshore detention (such as a Child Protection Panel three years ago, which left hundreds of children in detention until last week). In that case, no significant changes were made after the glare of the public spotlight faded. As it stands, politicians and bureaucrats can override doctors’ orders about treatment of sick refugees in offshore detention. The Prime Minister’s proposed Medical Transfer Clinical Assurance Panel will be hand-picked by the Minister, with no assurance as to the independence of its members, whereas the Urgent Medical Treatment Bill would provide for review of the Minister’s decisions by an independent medical panel including members nominated by peak medical bodies. The Bill also provides the Minister with the ability to veto transfers on national security grounds. Mr Morrison’s proposal does not specify a time limit for reviews. And it will not be enshrined in legislation – meaning it could be changed for any reason at any time. The cross-bench/Labor Bill is the only enforceable mechanism that ensures people get lifesaving medical treatment urgently. The coalition of six organisations – the Asylum Seeker Resource Centre, the Human Rights Law Centre, GetUp!, the Refugee Council of Australia, World Vision Australia and Welcoming Australia – today reaffirmed that passing the Bill before the Lower House was critical to giving refugees access to adequate lifesaving medical treatment. Without urgent medical treatment in Australia, medical professionals have warned that another person held offshore will die.